It’s become a morning sporting event; spot the hijack! One of our local radio stations has a presenter who is a master of the conversation hijack. He can turn any topic around to himself in seconds: conversation with the weather or traffic or business support team, interview with a guest, or news item. His hijacking skill is fascinating and it’s not a matter of if but of when; how quickly will he jump in and swing things around to himself. Usually it’s in seconds and only rarely as long as a minute. So, the game is to begin counting in seconds when he begins talking to someone: one, two, three, four, Hijack! One moment the theme is local or national news. Next moment he’s telling us about himself, his family, his wife, his marriage, his parents, his pets and their health, his wedding, his running, his holiday, his hobbies and interests, his health and accidents, and so on. His speed in turning the conversation to himself within a sentence or two is an impressive skill. And one shared by many. Mind you, he’s not as smooth as some I’ve some across – but, to be fair to him, this may simply be the short time slots he has with each person. In a face to face conversation he may be more subtle. That’s said, after months of listening to his morning programme, I’d guess he’s a Snatcher. Snatchers have neither finesse nor patience in conversation hijacking. But they are very effective. When talking with them, you daren’t pause to take a breath or they’ll jump in and hijack the conversation… leaving you open-mouthed like a gasping fish with no choice but to listen and endure. Sliders are the really skilful ones. Watch out for them because their skill has moved into the realm of Art. 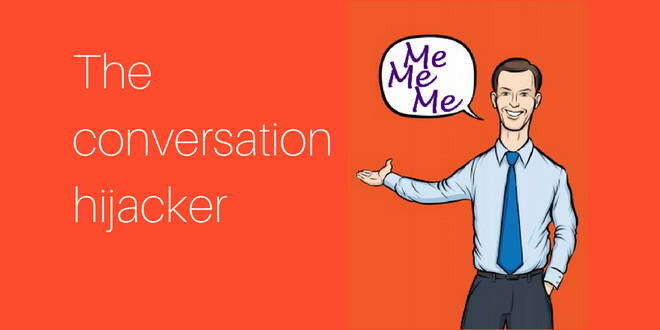 A good Slider will hijack the conversation so smoothly you don’t recognise the hijacked until both of you are talking about them. With expert Sliders, you don’t recognise the hijack until minutes or hours later. Chatting with Exchangers is a wonderful experience. They allow you the space to think and to explore your thoughts and feelings. You can even pause to take a breath – risk free. If they are going to talk about themselves they will wait for a natural link so that you are both exchanging views and experiences. They create an easy, natural rapport that’s based on mutual respect. One that is, sadly, not all that common.